I'm not sure how or when I stumbled across Josephine's blog, A Tasty Love Story, but I am ever grateful to have done so. Living in Denmark, Josephine takes a sincere approach to whole foods, giving a Nordic twist to the recipes that grace her table. Josephine understands ingredients in such an honest manner and uses her camera to tell their story. I know you'll love her stories, too. I grew up in a house where food played a big role. We have always been involved in deciding what to eat, grocery shopping and talking about the food we ate together. I remember summers spent in a strawberry field and cozy autumn evening spent with peeling apples and baking pies. My mom has played the leading role when it came to health, whole grain and vegetables. She has always stuffed us with colorful veggie juices, porridge, fish and all good things from the garden. I guess I was the one child out of three who enjoyed this the most, and still does! But we had those special nights where my dad was home alone with us, and he always asked us what we wanted… and we always wanted pancakes! My dad’s famous and fabulous pancakes. He made a thick batter filled with eggs, flour and foamy beer. He fried up a huge stack of thin and crispy pancakes – and we all had eyes as big as baseballs, just ready to dig in. On pancake nights there was one important rule. You needed to eat at least two pancakes with a savory filling – and then you could have all the dessert-y and sweet ones you wanted, every kid's dream! My brother always went for the sugar and jam ones, but I have always been my dad’s dairy girl, so I followed him and made one of the special creamy ones he created. My dad’s special trick was to add a big dollop of sour cream and a spoonful of blueberry or blackberry jam, roll it together and nicely enjoy every bit with fork and knife. I loved this. Loved how the soft cream dripped down the sides and made a beautiful swirl with the jam. Food filled with love, color and flavor. My love of food and indulgence definitely has its roots way back and I can’t thank anyone enough for this. Because I feel so privileged to get so much satisfaction out of something as natural and important as eating. 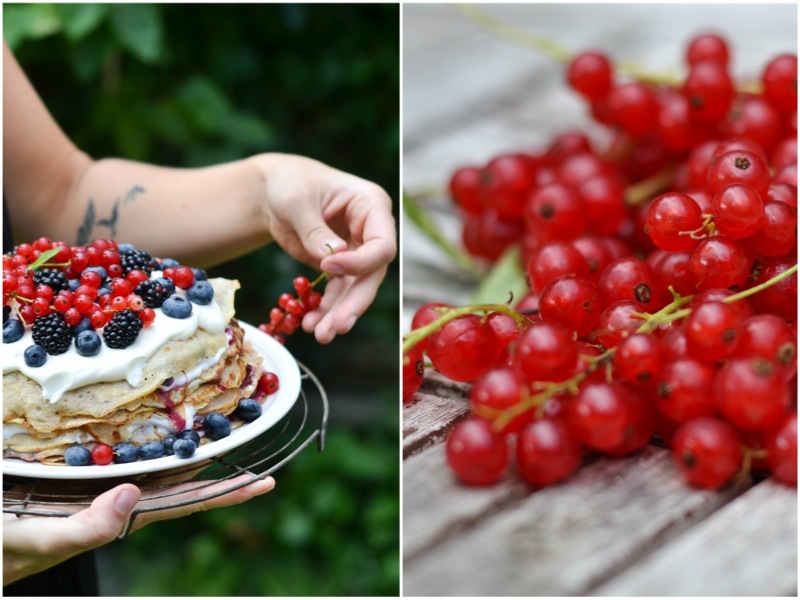 That is why this cake is not only a celebration of seasonal berries, Nordic cooking, pancakes (the fact that they exist) but, just as importantly, a celebration of the love of food – and the love food brings us! 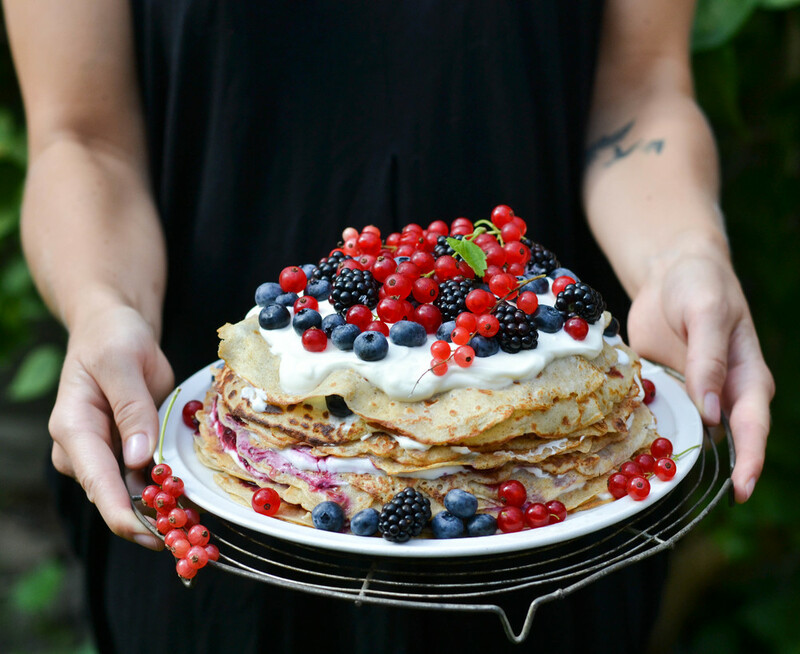 The pancake cake is a classic Nordic, and especially Swedish, thing. It is a wonderful concept really, where you just layer pancakes with your favorite filling in between and enjoy all of it as one big cake. 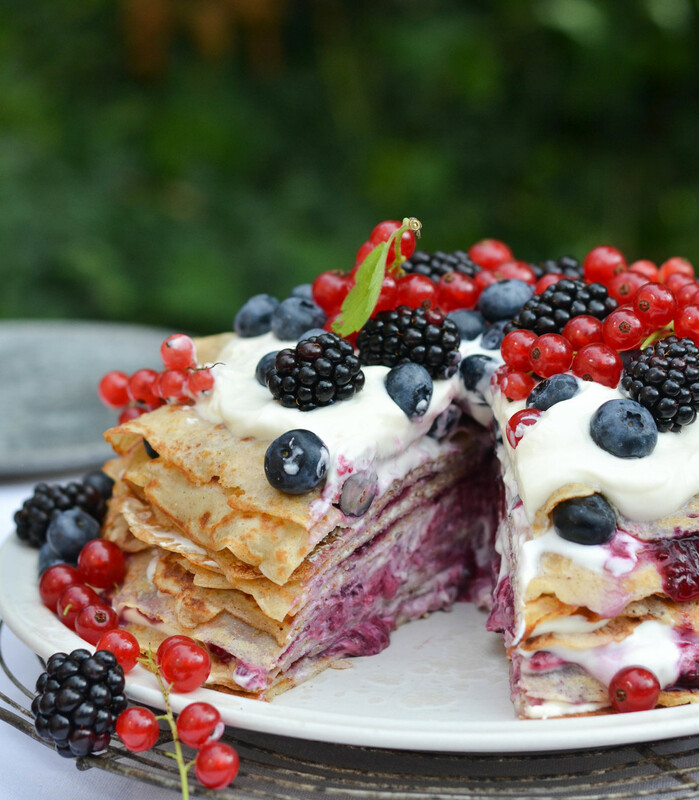 It is perfect for birthdays, dinner parties and to impress kids and adults – because, let’s face it, who does not love a huge stack of pancakes. As you might have guessed I have filled my cake with soft cream and jam, just as when I was a kid. The cream is half sour cream and half whipped cream, just to have some of that lovely cultured flavor combined with the fluffy and soft texture from whipped cream. The jam has been upgraded a bit and we now have a homemade berry compote, where the sugar content is moderate and we get some texture from the healthy and famous chia seeds. Remember that this cake can be made in all different ways and adapted to all seasons. For autumn and winter you can spice your pancake batter with warm spices as cinnamon, ginger and nutmeg and spread the layers with apples and cream cheese frosting. And spring provides you with rhubarb – to make a tangy compote and combine it with sweet vanilla cream! 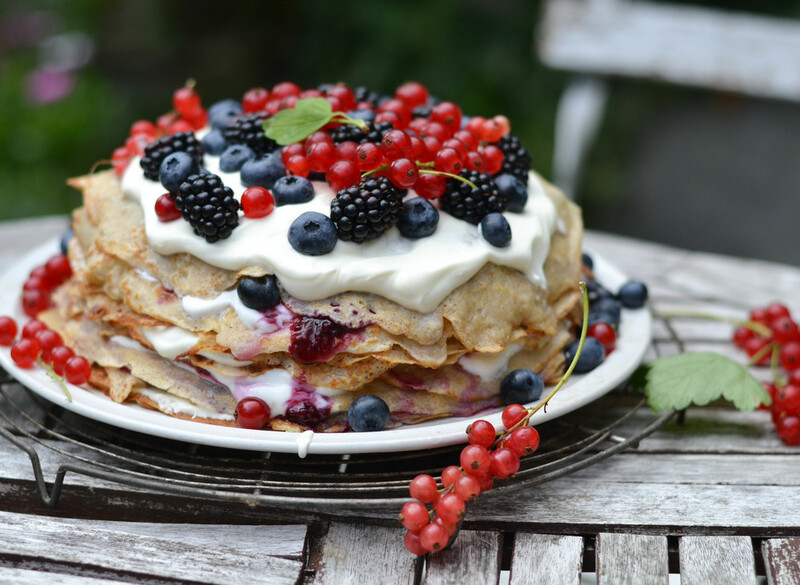 Furthermore the pancakes and compotes can easily be made a day ahead and then it is quick and easy to assemble just before serving… Enjoy! In a bowl whisk all of the ingredients for the pancakes together. Make sure to whisk thoroughly to avoid any lumps. Heat a frying pan on medium/high heat, melt some butter and add a thin layer of batter and fry the pancake for 1-2 minutes on each side until it is golden. Repeat with the rest of the batter. Let the pancakes cool before assembling the cake. Preferable 30 min-1 hour in the fridge. Make the compote by adding berries, juice and sugar in a pot and turn into a boil, turn heat down and let it simmer under a lid for 5 minutes. Then remove the lid and let it simmer another 5-10 minutes. Remove from heat and use a fork to gently smash the berries. Let it cool for a while and stir in chia seeds. Place in fridge to cool completely before use. It took me about 1 hour. Whisk the cream into a soft and airy whipped cream. Fold it into the sour cream. 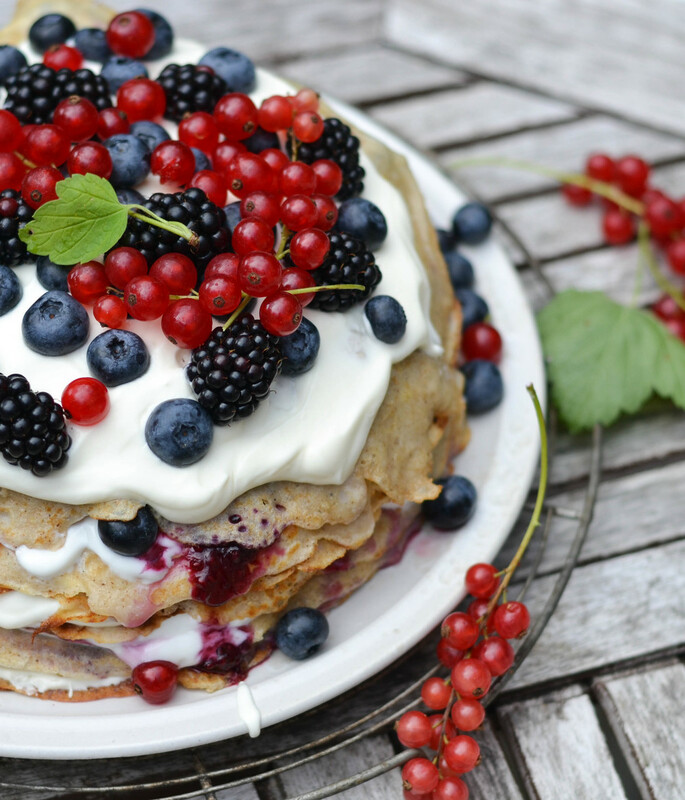 Assemble the cake: Place a pancake on a plate. Add a layer of cream or jam or combined and top with a pancake. Proceed like this with all of the pancakes until you reach the last one. Here you top with the rest of the cream and finish the whole thing with all of the lovely fresh berries. Serve the cake straight away.